Look no further than the 6 S Gentlemen’s ranch in Lavaca county. The perfect blend of weekend retreat and livestock operation to maximize family enjoyment and income potential…Plus Minerals!!!! Location: Located at 10855 FM 531 Approx. 13 miles south of Hallettsville. The ranch is 93 miles from Katy or Richmond. Both San Antonio and Austin are less than a two-hour drive. Terrain: The 6 S ranch is the ideal dual purpose ranch. The primary soils are Dubina, Tremona and Hallettsville Sandy Loam or Loamy Sand making for excellent grazing soils for livestock as well as browse for wildlife. Gently rolling hills with 20-30ft elevation changes on the ranch provide further diversity. 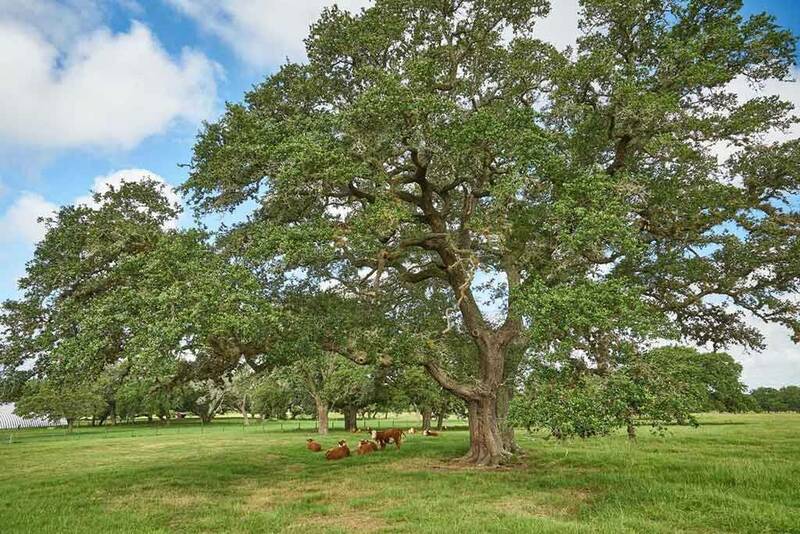 Habitat: Majestic oaks dominate the ranch providing for a picturesque landscape. Along the creeks, you will also find mature pecan trees and many other native species including wild grapes. The front half of the ranch is in improved grasses with mature oaks making for outstanding grazing for livestock. The back half of the ranch is bisected by Burn Camp and Clarks Creek providing exceptional wildlife habitat. Livestock: The current owners have utilized the ranch for a Hereford cattle operation. Livestock are not included in the sale but could be negotiated with the seller outside of this transaction. Wildlife: For the family that is also looking to enjoy the outdoor pursuits the ranch has a 5-acre lake with island which has produced a bass over 8 pounds and currently is stocked with Bass, Catfish, Perch and Crappie. There are 3 creeks traversing the property with the two primary being Clarks Creek and Burn Camp Creek. These provide for good runoff to the lake and ponds on the ranch and excellent habitat corridors for wildlife. The ranch is currently enrolled in the MLD whitetail program as part of the Lavaca County Wildlife Assocation. This program allows for enhanced harvest of whitetails during the season and enables common management goals to improve the herd and possibility for increased harvest. Turkey and wild hogs can also be found on the ranch for additional hunting opportunities. Improvements: The current owners built a custom 3,387 SF brick home in 2004. This beautiful 3 bedrooms 2.5 bath home is accented with mesquite floors, crown molding, custom built in’s and many other great features. The kitchen is all electric with granite counter-tops and stainless appliances. The main house compound features one of the largest oaks on the ranch as a centerpiece plus magnificent landscaping surrounds the main home. A separate structure is located adjacent to the main house providing 2 offices, ½ bath with kitchenette and large storage closet. Just beyond that you will find the garden and greenhouse. If you are looking to grow your own organic produce or enjoy getting your hands in the soil look no further! The main house compound is supported by an underground sprinkler system providing water as needed to maintain the spectacular landscape. Just beyond the main house compound you will find 3 barns. There is a large shop approximately 30’x110’ with a concrete floor. Second, there is a 6,500 SF 3 sided shed for equipment and implement storage. Lastly the ranch has a 6,000 SF hay barn. Also, located in this area is a great set of pipe cattle pens underneath the big oaks to provide shade for the cattle (and hands) during workings. The ranch contains two operating water wells in the main house compound. The first well services the residence and office. The second well is an irrigation well that produces 50-70 GPM per the owners and is used to irrigate hay pastures. The owner has run PVC underground to the hay meadow with risers for irrigation use. A third well is located towards the rear of the property; however, the 10-3/4” well has been plugged at 1440ft. It could be logged and perforated to use as a potential large volume well, per owner. All fencing appears to be in good to excellent condition with the ranch divided into many pastures to provide for ideal livestock and pasture management. Minerals: The owner believes they own 50% of the mineral rights and 100% of the executive rights. The owner will convey 50% of his owned minerals rights and 100% executive rights.